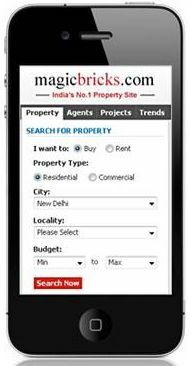 Times Business Solutions owned realty classifieds website MagicBricks.com has launched a mobile website MagicBricks Mobile. The website is now customised for mobile screens and GPRS-enabled mobile users can now search for properties to buy or rent based on property type, budget, city, locality, bedrooms and property ownership. They can also view details of interesting property listings from their cell phones. The website offers a tabbed browsing interface so users can refine the results with a single click. It also has a locality-based price-trends feature "QonQ" that is now accessible on the mobile. Users can instantly connect with brokers and owners by text messaging or calling the numbers listed by the classifieds site. "Now with enhanced UI and Navigation, intuitive refine and search options, property seekers can now find their dream home and contact the seller, within seconds from their cell phone," said Sudhir Pai, Business Head, MagicBricks.com in a statement. The site is free of heavy images and animations so mobile users can browse faster and will not require a smart phone. Users can also opt for free SMS alerts and send free SMSs to any property owner from the mobile site. MagicBricks Mobile will serve up results for 3000 commercial and residential projects across India.